Genshiken is the story of otaku, told from the perspectives of an outsider, an otaku neophyte, and veteran otaku alike. It centers around the titular Genshiken club, a university society that aims to combine appreciation of manga, anime, and games into one. Through the eyes of Sasahara, an otaku just becoming comfortable with who he is; Saki, a non-otaku girl who is dating the extremely otaku Kousaka and has to learn what it means to be an otaku in order to understand her frustrating boyfriend; and the rest of the Genshiken, the most focused on character of whom is Madarame, all of whom have major flaws which they must overcome. This story is honest, perversely honest in the case of a chapter at the end of the third volume contained in this omnibus. The characters presented are not stereotypes, they are as otaku truly are, flaws and all. The characters are strong for their weaknesses. Madarame is a character for Sasahara to look up to as an example of what he as an otaku could be like, but at the same time Madarame shows major personality flaws in that he is incredibly socially awkward around anyone that doesn’t share his obsession. Contrast that to Saki, who doesn’t understand the otaku at all, but is well adjusted enough that she knows how to interact with people. She doesn’t understand Madarame and the rest of the Genshiken, but as the volumes progress it’s clear that she doesn’t have a problem talking with them, even if she doesn’t fully understand what makes them tick. The same could not be said of Madarame and Sasahara, or any of the other Genshiken members besides Kousaka who is so comfortable with who he is that he doesn’t care if someone doesn’t share his interests. His hobbies are an intrinsic part of his personality, and because he is comfortable with that he does not need affirmation from his partner or anyone else. Nobody is ever portrayed as one hundred percent correct, or one hundred percent wrong. Genshiken is not a series that intends to moralize from any position, rather it tells a story using a certain type of character. And it does so while accepting the strengths and weaknesses of all the characters involved. Madarame could easily always be right, with none of his flaws focused on. Saki could be completely vilified as the outsider that doesn’t understand Otaku. Her criticisms of Genshiken could easily be used to moralize about the ills of otaku, but instead the story evolves organically, splitting between otaku relationships, otaku activities, and otaku in normal social circumstances. Each character brings something to each story that allows for a more rounded approach to the topic. Best of all, it does all this while being an immensely funny manga. Characters and their actions are realistic, but not to the point where Genshiken can ever be confused as a boring series. Humor is not derived from clever writing being spoken by characters in a way no one could ever in real life. Rather the comedy comes from the flaws of the characters, which in their realistic portrayal are much more effective than any exaggeration could ever be. Nobody acts the clown, and nobody is simplified to the point where their existence is for the sake of comedy. Rather they are real people, and sometimes real people can be funny enough without any exaggeration needed. However, as in all things no one thing is ever perfect, and there are flaws to this series. For one, while Sasahara is ostensibly the main character he gets surprisingly little focus past volume one. He is established as the new otaku getting into the lifestyle, but after that the focus shifts more towards Saki in volumes two and three. Which works as her reactions to everything around her are a lot more entertaining. Saki often comes across as being the audience surrogate character, but in a way that none of the audience members can actually relate to her. But one never gets the sense that she is meant to be the main character in those volumes. I’ve found that many manga lose focus of who their main character is for chapters on end, which can sometimes work and sometimes fall flat. In this case it works for the most part, as Kio Shimoku makes it clear he is not focusing on just one main character. But it becomes a flaw because he seems to want to have it both ways, with an established character, who we don’t learn that much about within this first third of the series, while also allowing himself the freedom of focusing on any character he wants. Kousaka is a minor problem as well, mostly with how much much of a non-entity he is. Very early on it becomes clear he is there to serve a purpose in Saki’s story, not to develop himself. Even within these three volumes it becomes clear that he will not be developing further, and that all changes necessary will have to be made by Saki. Which on the one hand seems a bit admirable in that she is so dedicated to the idea of a life with him that she puts up with a lot, but at the same time it staggers the relationship when only one of the members in said relationship feel like a real person. Genshiken is one of those rare series in that western fans can read it and have a “one of us” reaction to the material, while at the same time experience what it means to observe the “other”. Otaku, while somewhat analogous to western “geeks”, “nerds”, and “dorks” are in and of themselves significantly different because of the society they grow up in. Where geeks may face some discrimination, western culture focuses a great deal more on the importance of self. So while there is still some resistance against those that go against the mainstream, ultimately the overarching sense is that people are free to do what they want. Japanese culture places such a greater focus on the community the importance of being part of a team, rather than being an individual that anyone going against the grain of what society deems correct is all the more ostracized. While both experience a sense of persecution at some point in their lives, the personalities seen in Genshiken seem somewhat odd to someone that has not lived through what being an Otaku in Japan is like. So while we feel kinship with these fans of manga and anime, we still can’t help but feel that we don’t quite understand. 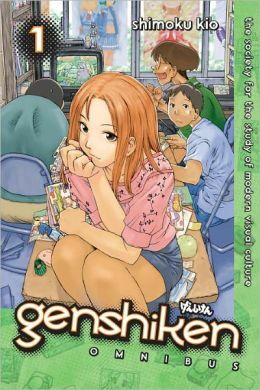 Genshiken helps bridge that gap in a way that other series have tried, and failed due to a tendency to over romanticize the whole affair. It remains one of my favorite series from years ago, and rereading it only pushed it higher up my list of favorite manga. After finishing it and not coming back for several years I had forgotten why I loved Genshiken so much. Sometimes I’ll finish a manga and remember it more fondly than it deserved, and sometimes I forget how great the manga truly was. Highly recommended for fans of manga, and even for those that want to know more about the strange beast that is a geek/otaku. Just be prepared that what you may find in these pages is more honesty than you may be prepared for.